A data source control interacts with the data-bound controls and hides the complex data binding processes. These are the tools that provide data to the data bound controls and support execution of operations like insertions, deletions, sorting, and updates. Managing presentation aspects like paging, caching, etc. There are many data source controls available in ASP.NET for accessing data from SQL Server, from ODBC or OLE DB servers, from XML files, and from business objects. XMLDataSource - It allows binding to XML files and strings with or without schema information. SiteMapDataSource - It allows binding to a provider that supplies site map information. SqlDataSource It represents a connection to an ADO.NET data provider that returns SQL data, including data sources accessible via OLEDB and ODBC. 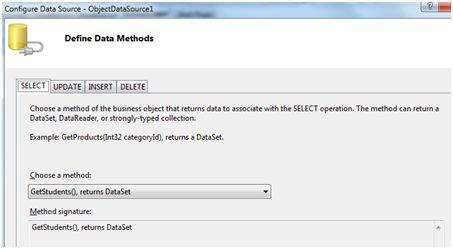 ObjectDataSource It allows binding to a custom .Net business object that returns data. LinqdataSource It allows binding to the results of a Linq-to-SQL query (supported by ASP.NET 3.5 only). AccessDataSource It represents connection to a Microsoft Access database. Data source views are objects of the DataSourceView class. Which represent a customized view of data for different data operations such as sorting, filtering, etc. Gets or sets the SQL statement, parameters, and type for deleting rows in the underlying data. Gets or sets the SQL statement, parameters, and type for inserting rows in the underlying database. Gets or sets the SQL statement, parameters, and type for retrieving rows from the underlying database. SortParameterName Gets or sets the name of an input parameter that the command's stored procedure will use to sort data. Gets or sets the SQL statement, parameters, and type for updating rows in the underlying data store. The bindable class should have a default constructor, it should be stateless, and have methods that can be mapped to select, update, insert, and delete semantics. Let us go directly to an example to work with this control. The student class is the class to be used with an object data source. This class has three properties: a student id, name, and city. It has a default constructor and a GetStudents method for retrieving data. Add a class (Students.cs) to it by right clicking the project from the Solution Explorer, adding a class template, and placing the above code in it. Build the solution so that the application can use the reference to the class. Place an object data source control in the web form. 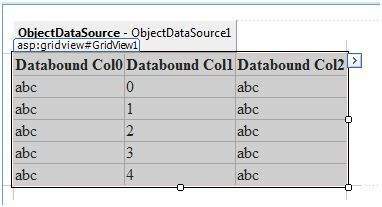 Configure the data source by selecting the object. Select a data method(s) for different operations on data. In this example, there is only one method. 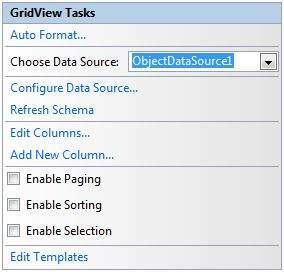 Place a data bound control such as grid view on the page and select the object data source as its underlying data source. Run the project, it retrieves the hard coded tuples from the students class. The AccessDataSource control opens the database in read-only mode. However, it can also be used for performing insert, update, or delete operations. This is done using the ADO.NET commands and parameter collection.